Based on extensive experience in building superb separate-type amplifiers, Accuphase proudly presents the E-406V, an integrated amplifier destined to become a new reference. Using only the finest of parts, the E-406V delivers sound quality on a truly high level. Dedicated transformers for the preamplifier and power amplifier sections and carefully designed circuit layout ensure total separation of these two blocks. A switch even allows using the preamplifier and power amplifier as independent components. Accuphase's highly acclaimed current feedback topology virtually eliminates phase shifts in the upper frequency range and assures uniform frequency response which does not change with gain. Phase compensation can be kept at a minimum, and high amounts of negative feedback with their associated disadvantages are no longer required, resulting in excellent transient response, with superb sonic transparency and detail. The power amplifier output stage employs a triple parallel push-pull configuration, using power transistors designed for high-current audio applications. This improves drive capability especially with critical low-impedance loads. The preamplifier section is designed around a current feedback line amplifier and is driven by a dedicated toroidal power transformer which eliminates any possibility of interference from the power amplifier. A total of eight input positions including two balanced inputs provide welcome flexibility, including two option slots on the rear of the amplifier for optional input boards. Besides a line-level input board, Accuphase offers an analog disc input board for MM or MC cartridges, allowing reproduction of analog records with outstanding sonic quality. The tape enthusiast will welcome provisions for two tape recorders, with easy dubbing in both directions. Summing active filter type tone controls and loudness compensation are further advantages. High-performance logic relays are used for signal switching, and a supplied remote commander lets the user operate the unit from any point in the room. The E-406V is an integrated amplifier with a full complement of features and simply great sound. When the gain of an amplifying circuit increases, frequency response, i.e. the bandwidth that can be handled by the amplifier, becomes more narrow. To counter this effect, a commonly employed echnique called negative feedback (NFB) routes part of the output signal back to the input. Conventional amplifiers employ voltage NFB, whereby the output voltage is used for the feedback loop. In the E-406V however, the signal current rather than the voltage is used for feedback. At the sensing point of the feedback loop, the impedance is kept low and current detection is performed. An impedance-converting amplifier then converts the current into a voltage to be used as the feedback signal. Since the impedance at the current feedback point is very low, there is almost no phase shift. Phase compensation can be kept to a minimum, resulting in excellent transient response and superb sonic transparency. A differential pure complementary push-pull circuit is used, with an emitter follower output stage. Current feedback topology further enhances circuit operation and reduces the need for phase compensation, resulting in effortless, utterly natural and transparent sound. Program source switching is performed by logic-controlled relays which are arranged so as to permit the shortest possible signal paths. The hermetically sealed relays are high-quality types developed specifically for demanding communication applications. The contacts are twin crossbar types plated with gold for minimum contact resistance and outstanding long-term reliability. The tone control circuitry in the E-406V was specially designed with summing active filters such as found in high-quality graphic equalizers. Figure 5 illustrates the operation principle of this circuit. The flat signal is passed straight through, and only when an adjustment is required, the characteristics are created at F1 and F2 and added to the signal, thereby producing the desired change. This design provides efficient control without degrading signal purity. Dedicated high-efficiency toroidal transformers are used for the power amplifier and preamplifier sections, to eliminate the possibility of mutual interference. 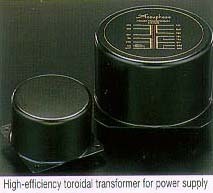 Toroidal transformers which use heavy-gauge copper wiring on a ring-shaped core have various advantages, such as very low impedance, small size, and high conversion efficiency. These characteristics make this transformer type ideally suited for audio applications. The E-406V uses transformers with near-circular core caliber. This allows near-circular coil windings with high packing density, resulting in low leakage flux and minimum vibrations. In addition, the smaller ferrite core diameter and copper windings with high specific gravity mean low ferrite losses and low inrush current. The oversize speaker terminals are made of extruded high-purity brass material which accept also heavy-gauge speaker cable. 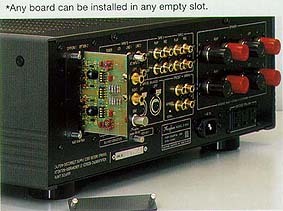 Two sets of outputs with a speaker selector are provided, and bi-wiring (supplying the same signal via dual leads to speakers with separate high-frequency and low-frequency inputs) is also possible. The large analog power meters have a peak hold function which lets you easily monitor the output level of the rapidly fluctuating music signal. Thanks to logarithmic compression, the meters cover a wide dynamic range. The input selector of the E-406V controls a total of eight positions, including two positions for optional input boards installed in rear-panel slots. Two of the standard inputs are designed for balanced connections which are impervious to externally induced noise, ensuring signal transmission with optimum sonic purity. Separate preamplifier outputs and power amplifier inputs controlled by a selector switch allow use of the preamplifier section and the power amplifier section as separate components. The rear panel of the E-406V provides two slots in which optional input boards can be installed in a matter of minutes. Two types of boards as shown below are available. * Both boards use the AAB (Accuphase Analog Bus) interface. * Any board can be installed in any empty slot.